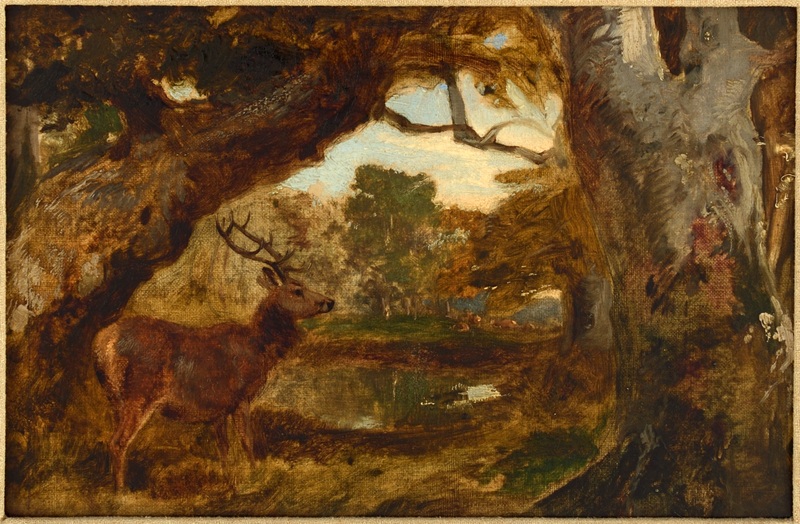 A View in Richmond Park by Sir Edwin Landseer, 1844. The original painting is held in The Hearsum Collection. The “Freebord” or “deer leap” of Richmond Park is a strip of Crown-owned land one rod wide (that is 16’6″ or 5m), running around most of the perimeter of the Park, the main function of which is to allow access to the outside of the boundary wall. “Freebord” (sometimes “Freeboard’”) is the technical term for the status of this land which has in the past been the subject of dispute between the Crown and owners of land adjacent to the Park boundary. Richmond Park was created as a deer park, with hundreds of red and fallow deer roaming free since the time of Charles I. Accordingly, in a somewhat romantic fashion, the term “deer leap” is sometimes used to suggest that this strip of land outside the wall was designed so that if a deer managed to escape its hunters and get beyond the deer leap, it was then free from capture. Given the value of venison to the Crown and the need to maintain the herd within the Park, this is an unlikely purpose for the freeboard which, more prosaically, was for inspection and repair of the eight miles of wall which define the Park territory. For those lucky enough to have land adjacent to the Park boundary there is an annual licence fee for use of the freebord, currently ranging from £2 to £200 per year, and there are a number of restrictions on building, and on tree felling. 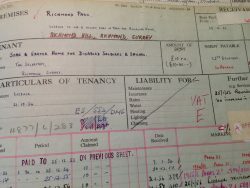 The Royal Parks, which manage the Park, consider these restrictions appropriate “because of Crown ownership and the need to protect the integrity of the Park.” These fees have been collected over the centuries and recorded in ledgers now in The National Archives. 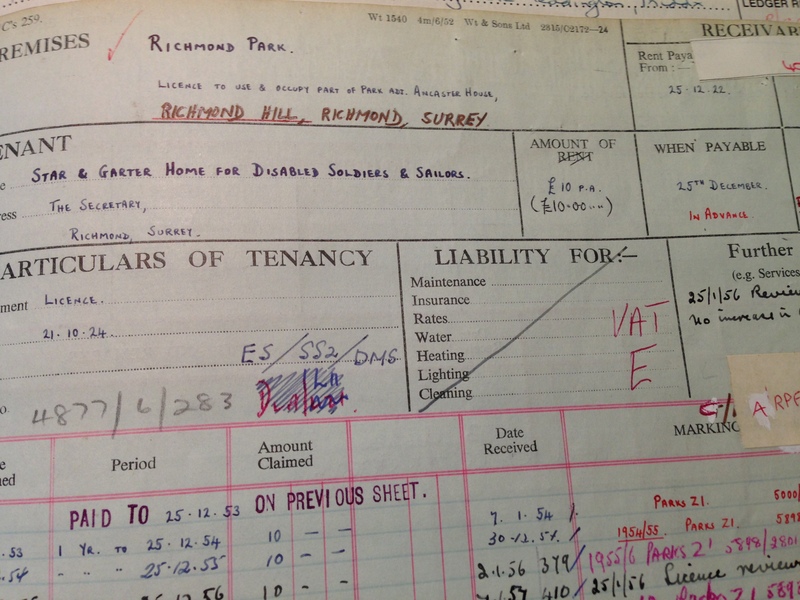 One such example shows that the Star and Garter Home was charged £10 in 1953, payable on 25 December, in advance. To ensure that the unique status of the freebord was maintained and that local residents did not abuse the protection of the Park wall which it provided, the Park managers from time to time organised “perambulations” of the boundary, to which “all Persons who shall think themselves anywise interested are requested to attend”. 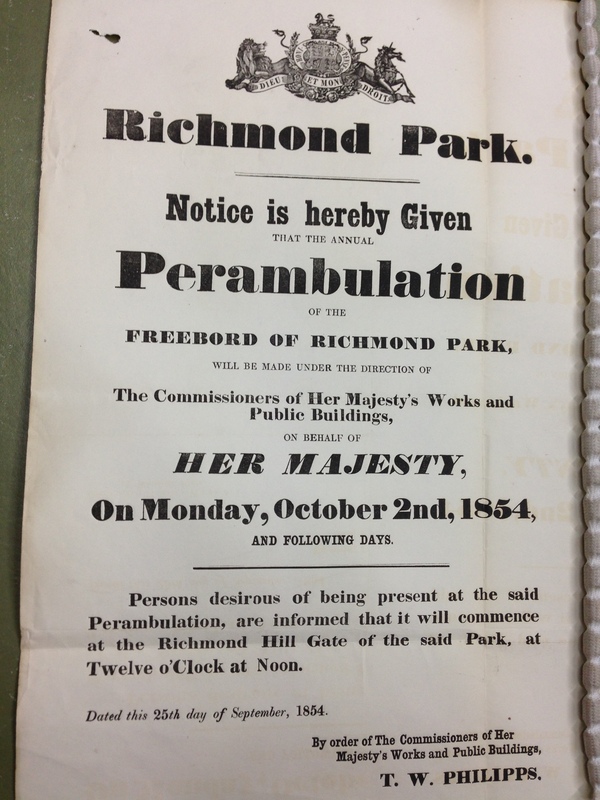 This kind of public inspection was advertised locally as can be seen in this notice from 1854. Once the fee was paid “encroachments” were normally allowed in the form of small outbuildings etc. The managers of the Park seem to have exercised a policy of pragmatism in relation to the granting of permission as a survey in 1911 lists 87 such encroachments, including a rent free one “at Sheen Lodge which is a Grace and Favour Residence”. Nevertheless, it is not surprising to learn that disputes between local residents and Park managers (representing the Crown) arose from time to time. One such example was a dispute over encroachment at Richmond Gate in the 1860s. 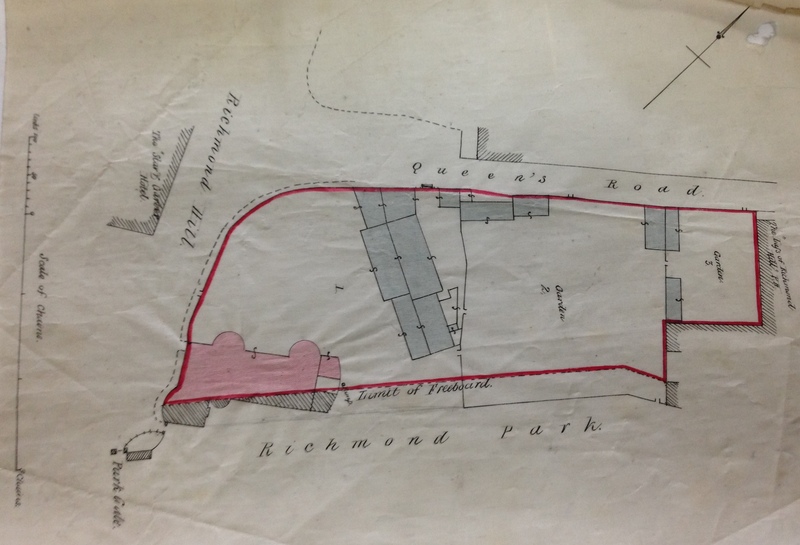 Sir Lionel Darell’s application for “enfranchisement” to allow buildings on the freebord near the Park gate, the then Star and Garter Hotel, and the Lass of Richmond Hill pub was “declined on Treasury instructions”. The justification for the decision is most interesting in that it was made “having regard to the interests of the Public in the preservation of the amenities of Richmond Park”. Note, the rationale was the public interest, rather than Crown privilege. 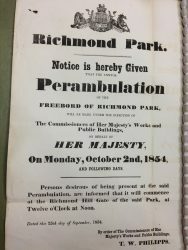 We can see in this decision how the status of Richmond Park was changing from that of a private royal hunting ground in Stuart times, to a public amenity to be shared by all in the Victorian period. Over the years encroachments permitted around the boundary of the Park have meant that there are now few places where the freebord is directly accessible by the public. 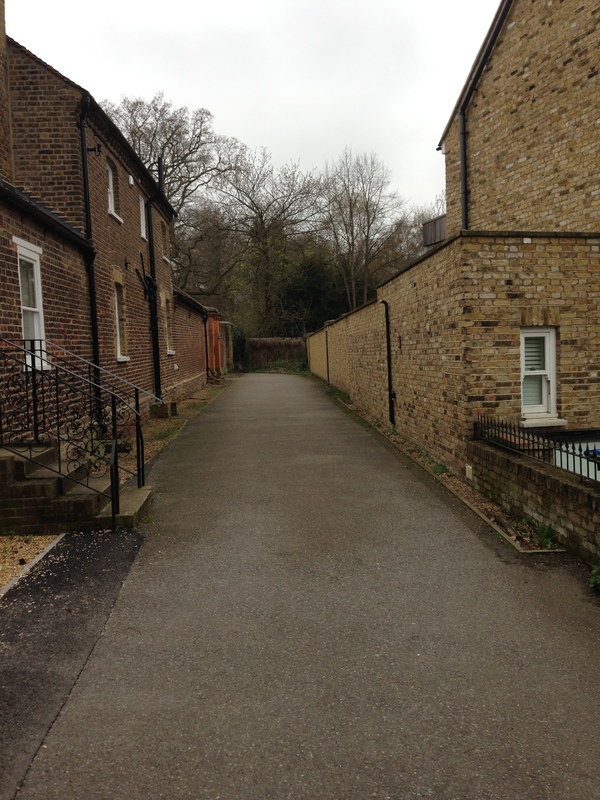 One such place is off Chisholm Road, leading to the pedestrian entrance at Bishop’s Gate, just east of Richmond Gate. Robert Wood has lived in East Sheen for 35 years. Following a PhD in international relations he pursued a career in Whitehall. He now researches the varied history of Richmond Park. Richmond History 39 (2018) includes two articles by him – about policing the Park in Victorian times and (jointly with Simon Fowler) about the Chinese artist Chiang Lee, who painted in the Park and also in Kew Gardens.